The Panther 10 is one of a family of economically priced, rectangular, ABS horn Speakers. With a response more suitable for speech, these horns are designed for internal or external use, having an IP66 rating. They are ideal for excellent sound distribution for a wide range of outdoor applications including car parks, factories and warehouses, security areas, events venues and other indoor and outdoor areas. 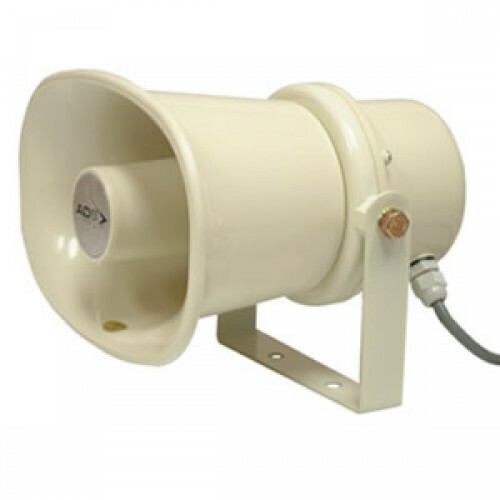 These speakers are for 100 volt line Public Address applications, and each has a range of power tappings. The horns come supplied with a swivel bracket. The different horns available are the Panther 10 (10 watt rms output), Panther 15 (15 watt output) and Panther 30 (30 watt output). 10 watt rms, 100 volt line, rectangular, ABS horn Speaker. 10 watt, 5 watt, 3 watt and 1 watt power tappings. IP66 rating for external use. Supplied with swivel bracket.